Experience Crater Lake National Park or the Oregon Caves National Mounument & Preserve depending on your interests, time and ambitions. Hiking and other amenities are available to enhance your enjoyment and appreciation of the Park or Monument. During the summer, you can explore old-growth forest or wildflower meadows. Climb mountains for great views of the lake or hike into the lake itself. For more detailed information on the trails in the park, click Here. You can ride your bike around the lake. In late-Spring, typically in June, the Rim Drive starts to open up. As plows clear the snow, more pavement becomes available for walkers, bicyclists and then automobiles. Typically, the entire Rim Drive is open by the beginning of July. Winter weather starts to close the Rim Drive in October or November. Click Here for a handout about bicycling in Crater Lake National Park. Whether just hiking down the Cleetwood Trail for a swim or joining a boat tour of the volcano, visiting the shore of Crater Lake is a unique experience. Typically the trail is accessible from July to October, depending on the snow we had during the winter season. If interested in a boat tour click Here. 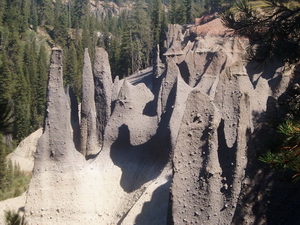 The pinnacles are towering needle-like formations of rock, called fossil fumaroles, projecting from the Sand Creek Canyon floor. They were formed under sheets of volcanic pumice that preceded Mazama's collapse. To reach the pinnacles. Turn on to East Rim Drive off of Munson Valley Road, then turn right on Pinnacles Road. Winters at Crater Lake can be long and snowy. Storms from the Pacific Ocean dump an average of 524 inches (13.3 meters) of snow at Park Headquarters. With Highway 62 open year round, you can always access the park for winter fun. Join a free ranger-led snowshoe walk on weekends through the end of April. Free use of park snowshoes during the walk. For folks with their own equipment, information on the park's cross-country ski and snowshoe trails, can be found by clicking here. Snowshoe and ski rental information is available, just click here. For snowmobilers, Diamond Lake Resort grooms the North Entrance Road. A ten-mile ride on the marked route brings you to an amazing lake overlook. The most common thing to do on the Monument is go on a cave tour. Click Here for the details and types of cave tours we offer. Discover six enjoyable Hiking trails that meander through the ancient forsets on the Monument and Preserve. Earn a Junior Ranger badge and help and protect the Monument.